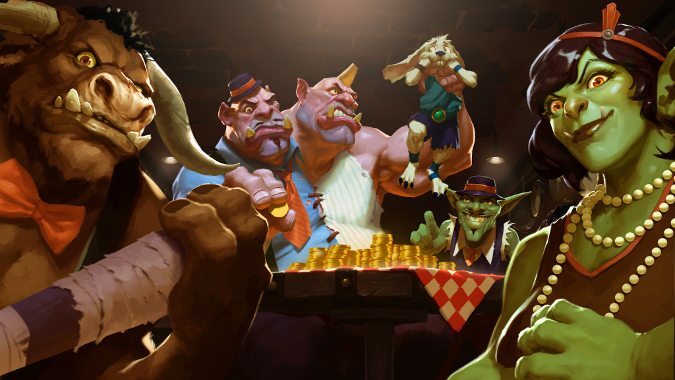 With the Mean Streets of Gadgetzan having been recently announced at BlizzCon, we’ll be compiling the full list of cards as they are revealed and spoiled here. Check them all out below with our commentary. Aside from the card reveals, the biggest theme about this expansion is the introduction of 9 new tri-class cards such as the Lotus Agents. 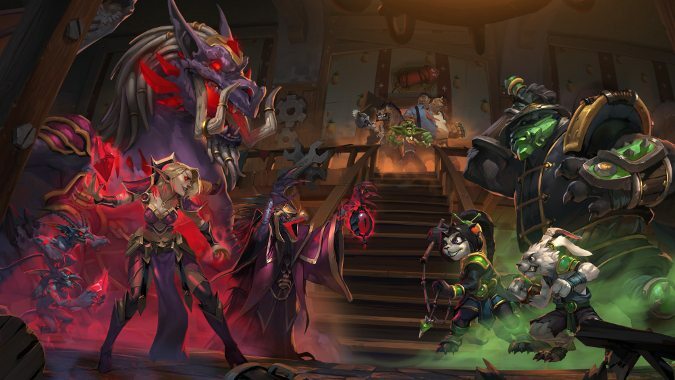 There are three major crime families running Gadgetzan: the Grimy Goons (Hunter, Paladin, Warrior), the Jade Lotus (Druid, Rogue, Shaman), and the Kabal (Mage, Priest, Warlock). You can check out a match to see some of the new cards in action. Each faction appears to have a unique mechanic associated with it. For example, the Grimy Goons have cards that can buff existing minions in your hand. This is one of the Grimestreet cards which will help augment the minions in your hand. You’ll see more cards similar to this later on. A simple Grimestreet discover card. Perhaps one of the better ones due to the low mana cost. He’s no Dr. Boom, but a +5/+5 buff is nothing disregard either. The Jade Lotus get a new mechanic with the Jade Golem. Every subsequent Jade Golem gradually gets larger (the first Golem is a 1/1, the second Golem is a 2/2, the third is a 3/3, and so on and so forth). Lets you discover a Druid, Rogue, or Shaman card. Quite costly, however. Those classes might have better 5 cost cards available. Not one, but two potential Jade Golems here with this one. Lets you add a random potion to your hand. 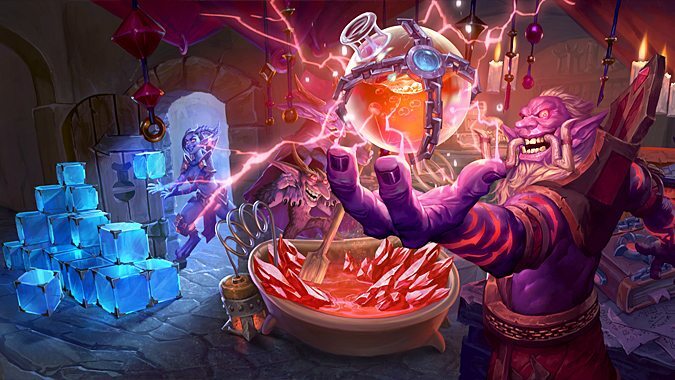 You can see the various potion cards among the Kabal classes below. Pick and discover a Mage, Priest, or Warlock card. Provides alternate 3 cost cards for those classes. Kabal’s main legendary. Utilizes the Reno Jackson mechanic to create a new spell. Just a simple buff card. Possibility for a Fatigue Druid deck here! Could be a staple in beast Druid decks but I don’t see it replacing Druid of the Claw anytime soon either. If you play this on curve, the odds of you having a 5 attack (or higher) minion is going to be extremely low. So the question is do you want to play it now for immediate gain or wait until later on in the match when you have your heavy hitters out for the extra stats? Wild Growth with a slightly higher upside. The question is would you play the Jade Blossom or Wild Growth? Growth is a turn faster but Blossom gives you a little extra tempo. Interesting card as it can be ramped into easily allowing you fetch cards early. If they happen to be minions, they’re cheaper! Seems like a high risk, high reward card. If you happen to play a more aggressive style of Druid with early game minions (like maybe some Living Roots minions), then this card can pay off and accelerate your mana — if you have the minions on board to back it up and big minions in your hand to follow through. Wouldn’t you rather have a minion on turn 3 instead to develop further board pressure? Kun can be a free minion or can be used for extra armor stability in the late game. Will be a force after the standard rotation for sure. Offers another option outside of Yogg or C’Thun Druid for a finisher. Beasts are really being pushed this set. Trades great with other opposing 1/1s as you’ll get another. I suppose cats in this game only have two lives instead of nine. Some new secrets in this expansion and Hidden Cache is for Hunters. +2/+2 buff to one of the minions in your hand at random helps provide added punch. Perhaps a more Secrets laden Hunter deck could work here. Solid 2 drop for Hunters and it can be used alongside Huge Toad. We might be seeing the return of Hunter to the top of the pack. A bit too expensive for a weapon, but it does generate a steady stream of Piranhas for you. The 2 damage seems a little underwhelming to me but the 4 durability is about right. Makes the opposing player think twice before getting rid of the Zipgunner. Playable on curve and provides another option that isn’t Animal Companion. Amazing 4-cost card for Hunters and provides them with both on demand removal and a turn 4 body. Houndmasters or Kodos? I’d pick Kodos for the control ability. Don’t forget all the buff cards that the Goons have access to. Nice Rat insurance in case Rat Pack dies. The number of Rat tokens you get is based on the minion’s attack power. It’s a Haunted Creeper with a higher upside. Hunter legendary. He seems to be okay. Secrets Mage making a come back maybe? This one’s a coin toss for me. You’re getting an additional friendly minion being added to your deck. If the Soulcaster comes out late game and hits a powerhouse card, then it’ll be fantastic. But if you’re playing it on curve, do you really want a second Mana Wyrm? Is the Sorcerer’s Apprentice gonna stick long enough after turn 2 to be copied? Get yourself a free spell on top of the Inkmaster but that’s only if your deck contains all unique cards. Spell which buffs minions in your hand. Only works well with Murloc Paladin. A new secret card for this expansion adds new life to potentially dead minions. Now if the Kodo happens to catch some Battlecry minions, it’d pay for itself easily. How about another Mysterious Challenger? Immediate threat that needs to be dealt with when a Paladin plays it. The thing is if the minions are in the Paladin’s hand, they’re not doing anything on the board and aren’t a threat yet. Still, every turn that Enforcer stays out means things’ll get worse. Provides Divine Shield to minions on either side. I’m not sure how strong this card will be in constructed play, but I think it’ll do better in arena. Nice deck thinning card. I don’t know if I’d run two copies of this card unless I’m running a pure early Paladin Zoo deck of sorts. With all the buff cards from Paladins and Grimy Goon cards, this Deathrattle condition should be easy to hit. In most cases, you can guarantee 4 health from Burnbristle since the Divine Shield will help protect the first bit of damage. Lets you steal a low attack minion. Great way to snag those Knife Jugglers and run them into other opposing minions. Helloooooooo new Priest staple card. Expect the Talonpriest to become a regular part of Priest decks to come in the future. Might be something to include in a future Control Priest deck as a potential one-of though. Two might be a bit much. Helloooooo life gain! Now that’s a healing spell. They’re really pushing Dragon cards in this expansion. Dragon Priest only gets stronger here. The 6 health allows it to stick around a little longer. Total utility card but it needs to be coupled with cards such as Cabal Shadow Priest, Shadow Word: Horror, or Confuse to take advantage of the drop in attack in order to be useful. Fantastic two drop. If left unchecked, can start filling the board easily. 5 damage to all minions except Dragons? Sure, I’ll take that! It’ll work great unless your opponent happens to be playing it. Amazing Priest legendary. Have to go the Reno route and use a deck without duplicates, though. It’s a Coin that only Rogues can use. Great way to help activate their Combo cards. The Assassin can guarantee a couple of effective trades as it can’t be targeted if it kills another minion. Shaku is good for at least one free card from your opponent. Perfect tempo spell for Shaman players, I imagine. You can use it to remove a minion and get one of your own in the process. Like a worse Muster for Battle — Doesn’t even provide a weapon. Synergy with Murlocs though (and Blood Lust). You know, there’s some real possibility to this card. Control Shaman might use this. The Illusionist needs to attack a hero to gain full value. It might be worth running the Illusionist into a minion on the board first due to the high 6 health before attacking your opponent directly. White Eyes is the new Shaman legendary that shuffles a 10/10 Storm Guardian into the deck if White Eyes gets destroyed. The Storm Guardian is also 5 mana. Hey, it’s Hellfire on a body! I suppose every set needs to include some kind of Murloc. High risk, high reward minion. The Apothecary will be a major threat on the board but it does punish you if you decided to add more minions to your board. Need to have some Demons in your hand to truly make this guy worthwhile. A definitive board clear for those moments when you absolutely need it. I’m declaring this the best named card in the set. Let’s you look for and discover a Taunt minion. A big buff to a random minion in your hand after every turn. Hey, this card combos quite nicely with I Know a Guy! Control Warrior continues to evolve. Will this card become a staple? I’m not sure. I suspect it’ll be included as players tinker and experiment, but it might not have enough attack to help challenge the board. It would need some Goon buffs to beef it up more. Buffs a random weapon in your hand. Otherwise, not a completely terrible 3 drop. Conditional board clearing spell. Requires you to have damaged some minions first to begin with. This is one of the weapon cards in this expansion for Warriors and it’ll buff a minion after every attack. Hobart is the new Warrior legendary and appears to be highly weapon focused. Cheap cost to boot. Extra attacks to your Fiery War Axe are never a bad thing. A much more Crazed Alchemist, it seems. 4 health back to both players if it dies. Would a Warlock include this as a 2 drop? Consistent card that only gets strong as your minions get eliminated on the field. Has to be dealt with immediately before it snowballs. Technically 6 mana for a combined 7/7. You’re getting two minions out of this card. If your opponent has 3 minions in play and you have none, you’re going to be way behind. Still, a decent minion. The Soulfiend seems like a better version of the Injured Blademaster which makes it useful for Priests. Realistically it’ll enter play and be useful on the board as a 3/5. You can then trade him into an opposing minion or use your Priest heal to recover. Useful card and is a neutral minion with card draw abilities. Useful for certain classes that don’t have that ease of card draw. Remember the Deathlord from Naxxramas? It makes a come back here. Could prove risky depending on what minion it fetches for your opponent. An annoyance to both players. Interesting! A Battlecry oriented minion! … Yet another Murloc. If Finja sticks around, you can start swarming and overwhelming your opponent with Murlocs from your deck. Definitely a fun card. I’m not anticipating Patches to be competitive at all but hey, play him for fun! Works great with Gang Up before it rotates out. 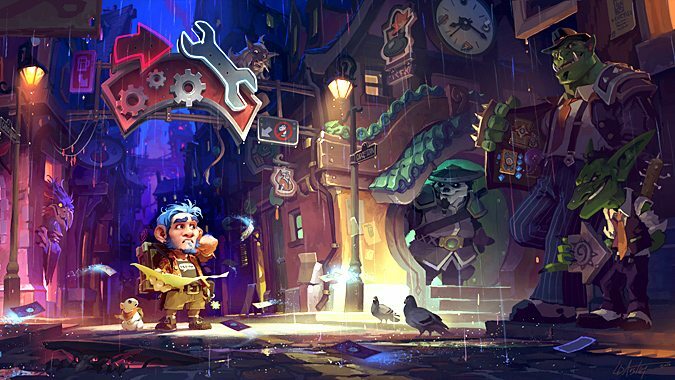 Think about the hero powers that would benefit greatly from the hero power reset. Then think about classes where spells are often used. Mage? Hunter? Shaman? Play Barnes on Turn 4. Hope it lives on Turn 5. Then play Madam Goya into Barnes and hope you hit something. Did anyone espect to see this guy? I sure didn’t. Hrm, more random elements added and this all applies to targeting. Sally is an interesting and tactical use card. Needs further experimentation. She’s fairly cheap to play though. 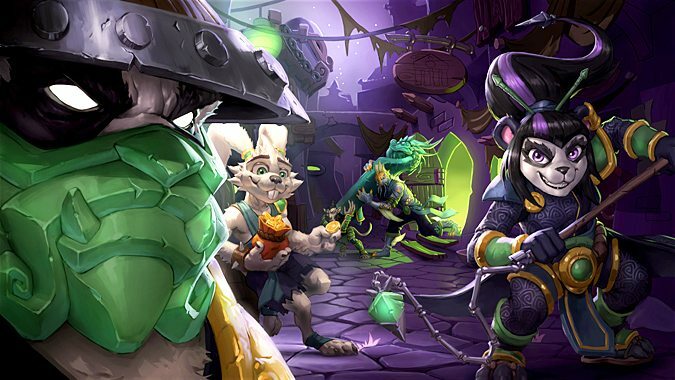 Are you planning on preordering this expansion? I know I will be once Monday rolls around and preorders become available! I’m intensely looking forward to the upcoming format switch to Wild! It’ll greatly shake up the tournament and ranked game scene. I haven’t played competitively in a few months.